Oh for the Midas touch of J.K. Rowling, with her divine knack for spinning yarns, and making money. The Harry Potter film franchise grossed almost $8billion, her Cormoran Strike crime novels have become an acclaimed BBC drama, and in 2016 her Potter prequel Fantastic Beasts and Where to Find Them was a huge box office hit. That film marked her screenwriting debut, and she’s also the author of this sequel, a windy, fog-laden affair in which the otherworldly wizard Newt Scamander (Eddie Redmayne) comes face to face with evil. In his own good time, mind you. The 2016 film flew along at a satisfying pelt, and was bursting at the seams with visual invention. It was better than any of the Potter films in my opinion, but this time the beast is out of the bag, as it were, meaning all involved have to work much harder. At the end of the first film we were introduced to the shape-shifting dark wizard Gellert Grindelwald (Johnny Depp), a fastidious maniac who wants to collapse the magical world order and substitute a new one of his own. As Fantastic Beasts 2 opens he’s cooling his heels in a Ministry of Magic prison in 1920s Manhattan when he seizes an opportunity to escape. The cast for Fantastic Beasts: The Crimes Of Grindelwald. From the left is: Jude Law as Albus Dumbledore, Ezra Miller as Credence, Claudia Kim as a Maledictus, Zoe Kravitz as Leta Lestrange, Callum Turner as Theseus Scamander, Katherine Waterston as Tina Goldstein, Eddie Redmayne as Newt Scamander, Dan Fogler as Jacob Kowalski; Alison Sudol as Queenie Goldstein and Johnny Depp as Gellert Grindelwald. Grindelwald, who dresses gothically and is surrounded at all times by foppish flunkies who look like extras from a Marilyn Manson video, bears a particular animus towards Albus Dumbledore (Jude Law). They were once firm friends but fell out, and since Dumbledore (Jude Law) formed a blood pact with Grindelwald, he cannot now oppose him. 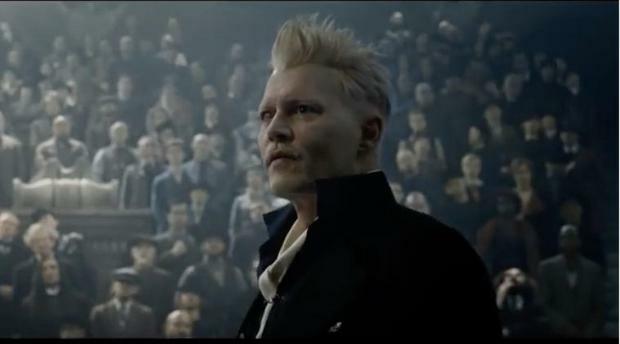 And as Grindelwald prepares to unleash the dogs of war, the problem is, who will? Happily, because she’s great fun, Alison Sudol’s ditzy New York sorceress Queenie returns, as does her hapless Muggle fiance Jacob (Dan Fogler), who accompany Scamander on a dangerous expedition to Paris. Newt might seem sexless, but is mighty keen on Tina Goldstein (Katherine Waterston), a stern but handsome American Auror he formed a bond with in Fantastic Beasts and Where to Find Them. He also seems drawn to Leta Lestrange (Zoe Kravitz), a gifted but complexed old Hogwarts classmate. But she’s engaged to Newt’s brother, and that is only one of the complex relationships that will be sorely tested by Grindelwald’s scheming. It will also test your patience. While the original film zipped along breathlessly, The Crimes of Grindelwald proceeds at an oddly funereal pace, dwelling lovingly on gloopy special effects that tend to occlude the actual drama. Eddie Redmayne is pretty good as Newt I suppose, though his diffident eccentricities seem a little more studied this time. And while Jude Law is surprisingly good as a young and virile Dumbledore, we don’t get to see that much of him, probably because he’s being held in reserve for the next instalment. Unfortunately, we see lots and lots of Grindelwald. Has Johnny Depp forgotten how to act? Have five outings as the pantomime dame Jack Sparrow shattered his thespian compass and any residual sense of restraint? He has chosen stillness as a weapon in this film: his Grindelwald inhabits the stage with pouting menace, whispering poison commands into the ears of his underlings. He speaks with a ‘British’ accent of course, and sounds like a Tory Brexiteer who’s been at the sherry. He’s impossible to take seriously, and leaves a gaping hole that a menace on the scale of Ralph Fiennes’s Voldemort should have occupied. It’s the biggest problem in a film that entertains in spots and does boast some impressive effects but is not a patch on its predecessor.